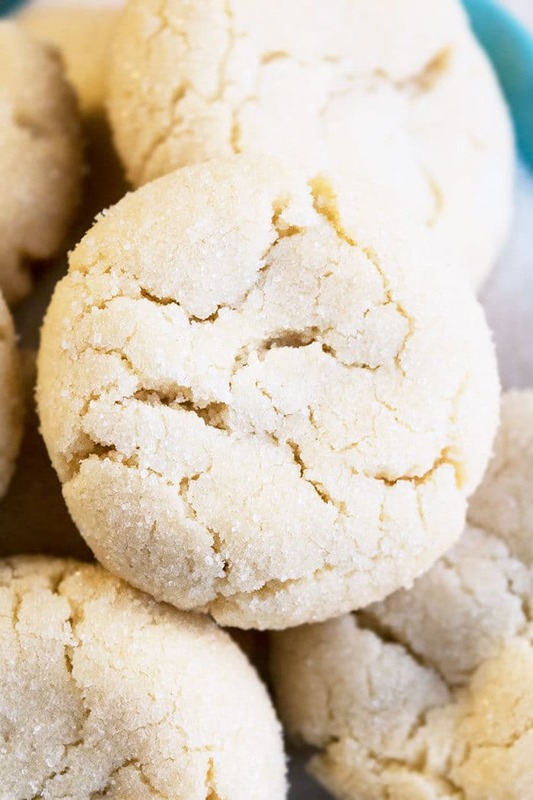 Quick and easy sugar cookies recipe, homemade with simple ingredients from scratch. Soft and chewy! No chilling required! These traditional and classic cookies have been in the family for years and we make them for all occasions like birthday parties, weddings and especially the holidays. 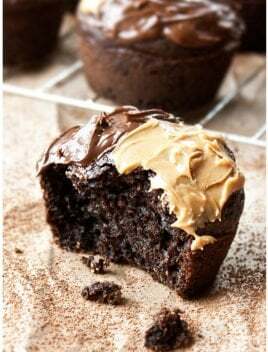 This is absolutely a no-fail recipe and even beginners who have never baked in their life can make them. 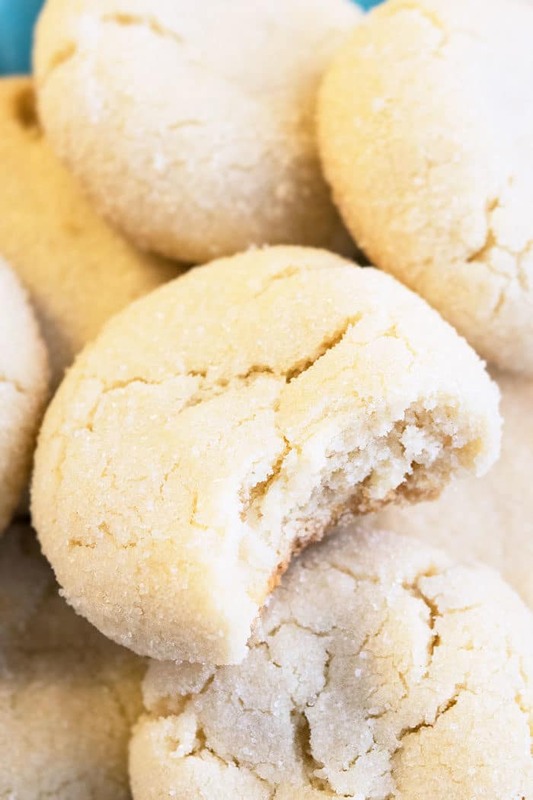 They are easy enough to make with kids plus they also make a great homemade gift, just like these Best Shortbread Cookies (3 Ingredients). 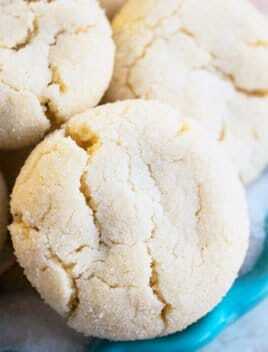 How to make best soft and chewy sugar cookies? Mix in eggs and extracts. Mix in flour, baking powder, baking soda. Frost them if you like and enjoy! How do you make sugar cookies keep their shape? 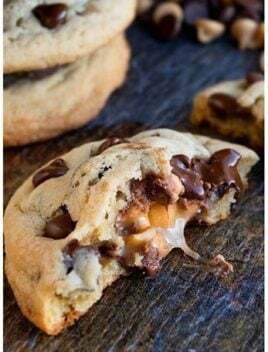 Measure ingredients correctly because baking is science and this would ensure that your cookies turn out exactly like mine and all those ingredients and quantities work together to create perfect results. Chill the cookie dough balls in the freezer for 15 minutes and then bake. This will slow down the spreading during baking. Don’t flatten the cookie dough balls because that just makes them spread even more, while they bake. 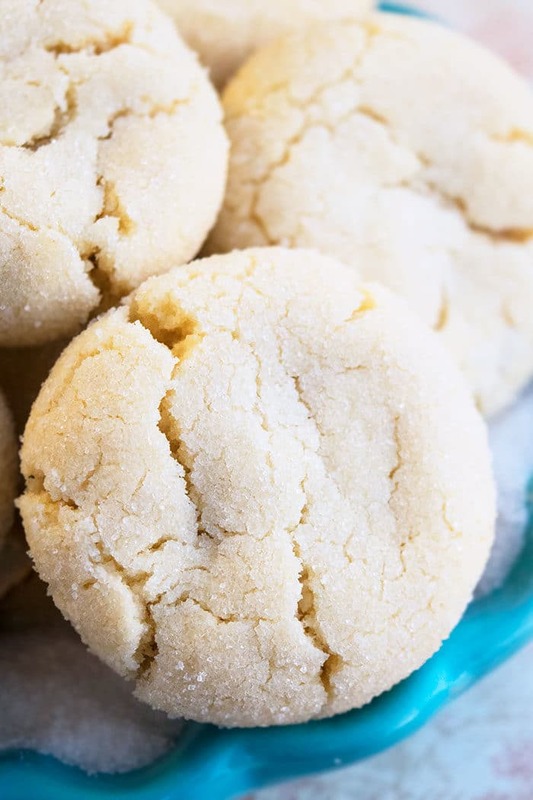 Are snickerdoodles and homemade sugar cookies the same? No, they are not the same. 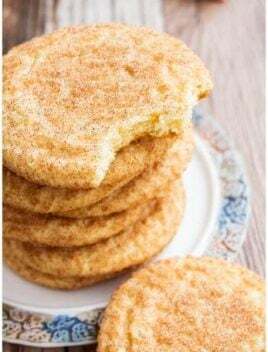 Classic Snickerdoodles Cookies have a spiced flavor and are rolled in cinnamon sugar. They also typically have cream of tartar as one of the main ingredients. These cookies, on the other hand, are loaded with vanilla flavor and rolled in granulated sugar. Both cookies have a soft and chewy texture though. How long do Christmas sugar cookies last after baking? They can last up to 3 days in a sealed cookie jar at room temperature, unfrosted. They can last up to a week or more, frosted, if you store them in a sealed container in the fridge. You can also freeze them in air-tight sealed freezer bags for up to 1 month. All ingredients should be at room temperature because that allows them to blend together smoothly and evenly. These are not Rolled or Cut Out Sugar Cookies. Those ones can be decorated with Royal Icing or Glace Icing and they can be cut into various shapes with cutters. Use unsalted butter to prevent cookies from becoming too salty. Don’t replace butter with oil because that will change the consistency of the dough and make it very sticky. 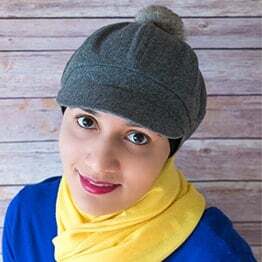 I have tested this recipe with other types of flours and all-purpose gave the best soft and chewy texture. 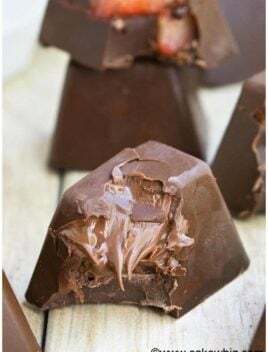 Almond extract is optional and only adds a hint of flavor. It is a strong extract and I highly advise you to go easy on it. Instead of vanilla extract, you can also use vanilla bean but that will add little black specks in the dough. If the dough is difficult to handle or feels sticky, cover bowl with saran wrap and chill in the fridge for 30 minutes to make it easier toll into balls. 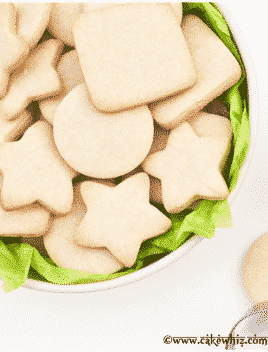 Quick and easy sugar cookies recipe, made with simple ingredients. Soft and chewy. 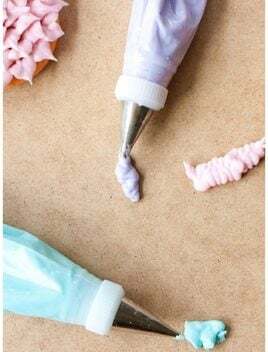 Decorate with frosting. Holds its shape! No spreading! No chilling! In a large mixing bow, cream together butter sand sugar until light and fluffy. Add egg, extracts and mix until smooth. Add flour, baking powder, baking soda and mix until just combined to a cook dough consistency. Scoop out small portions of the dough and make balls. Roll in a bowl of granulated sugar. Bake at 350 degrees for 12 minutes or until edges are firm and light golden brown. Allow them to cool down and enjoy! Leftovers can be stored in a sealed cookie jar at room temperature for up to 3 days.